Sail with us and see the Sun Rising from the Sea! Leaving from Port Vell according to the daily sunrise time, experience the sunrise from a different view. 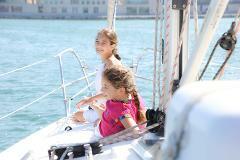 A 2 hours Exclusive Tour from Port Vell up to 11 passengers! Enjoy the Best Point of View of Barcelona when the Sun is going down! A 3 hours Exclusive Tour aboard of a luxurous sailboat from Port Vell up to 11 passengers, departure time at 8:45am, 12:00pm, 3:30pm and 4:30pm in June and July. A 4 hours Exclusive Tour aboard of a luxurous sailboat from Port Vell up to 11 passengers, departure time at 09:30am, 12pm, 2:30pm and 3:30pm in June and July, from 479,00 euros per boat. Enjoy the Best Point of View of Barcelona when the Sun is going down! Experience the sunset whilst having snacks and drinks. 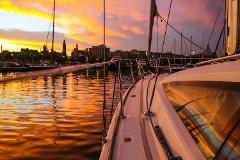 Enjoy 5 hours Exclusive Tour aboard of a luxurous sailboat, from Port Vell up to 11 passengers! 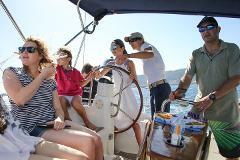 Everyday departure at 9:00am, and 2:00pm, from 569,00 euros per boat. 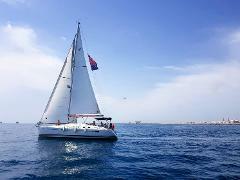 Enjoy 6 hours a board of a luxurious sailboat up to 11 passengers, food and beverages included! Departure time at 9:00am and 1:00pm from april to september. 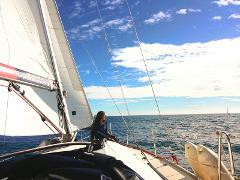 Enjoy 8 hours a board of a luxurious sailboat, food , beverage and professional skipper included! Departure everyday from Port Vell at 09:30am and 11:30am from April to September. Up to 11 passengers on board from €839,00 euros. Enjoy 3 hours on board of a Luxurious Catamaran, food and beverage included ! Departure time at 09:30am, 2:30pm and sunset everyday ! Up to12 to 23 passengers, from €1330 euros per boat. 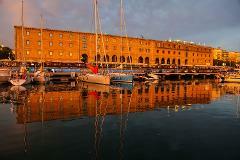 Enjoy a Sailing Experience in Barcelona starting from Port Vell (known as the Old Harbor). 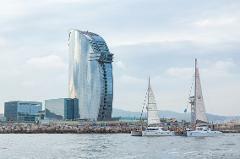 A Tour (2.5-hour) that will take you along the coast from the Port to the Barceloneta area on a 12 meters sailing yacht with a light brunch! 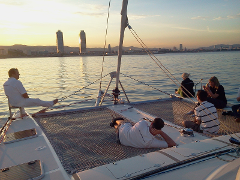 Enjoy the Best Point of View of Barcelona with this sharing open tour of 2,5 hours on our 12 meters Sailing Yacht, with our professional Skipper. 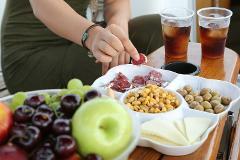 From exclusive Port Vell every day, drinks, light merienda, snacks and fresh fruit included.